Friday, May 18th is National Bike To Work Day and we’re excited to host a Commuter Coffee Stop for all those traveling through East Brookside! Join us from 7:30 – 9 AM for celebratory coffee and doughnuts and free Sloop Dental Co. swag, including a super soft t-shirt. While you’re here, your bike will rest happily (along with Dr. Sloop’s!) 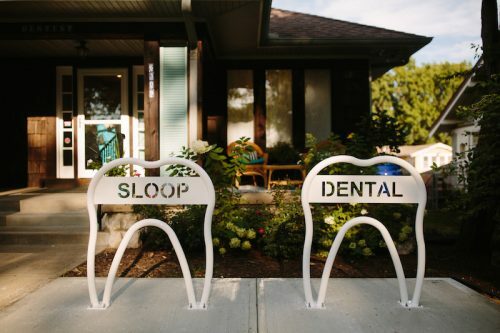 on our awesome tooth-shaped bike racks.